We have talked about it and dreamed about it for some long (or so it seems) but today Amazon and Barnes and Noble both say they ship in 24 hours. It feels a lot like having a new baby. I just met with Alandra Johnson of The Bend Bulletin for an interview. She asked me why I decided to write a book. The truth is it was never my intention to write a book. Nothing was working for Billy Ray. We had tried a residential treatment program to re-establish meds. School didn't work . The story is told more fully in the book but basically I just needed to go to a very specialized school (where Billy Ray was the head teacher and I was the only pupil in the beginning). I remember saying to Billy Ray as though he could understand fully "it seems like no understands but we are going to figure this out if you help me." After much experimentation and frustration for both Billy Ray and me we began to discover things that made day to day life better for the whole family especially Billy Ray. Then we had to learn how to regroup in terms of advocating so that we could demonstrate what we had learned about Billy Ray to those in a position to help educationally and the medical professionals. It was another phase of trial and error. As Billy Ray made progress, I began to get encouragement from many of the professionals involved to write a book or speak to parents. I was initially hesitant because of the time involvement in just taking care of Billy Ray day to day. However, I started writing on his old computer at night when I had to be in his bedroom so that he would stay in there until he hopefully went to sleep. I knew that with my time constraints I would have to have an agent. We subscribed to Writer's Market online to figure out how to do that. I read that it is harder to find an agent than to find a publisher. It took six months and a lot of polite (or not so polite rejections) to find my agent, William Brown. William helped me hone a book proposal which he editor shopped for over a year. He found me a wonderful publisher in AMACOM Books. They have been so patient and shared my goal of sharing with other parents. It started out to be only for parents but amazingly there is interest from some professionals as well. I was honored by comments from Billy Ray's medical provider in an email the other night: "I read two more chapters...very informative. Many things I really never thought about. I think the strength of your book is the perspective it delivers. It is truly impossible for people to consider the challenges you face." The most rewarding comment so far was from Kate Crow, a genetic counselor, who wrote the foreword. She told me that she read the manuscript through twice because it helped her to understand the families she worked with better. The most important thing for me in writing it was that I not tell other parents exactly what to do for their child. Books that told me exactly what to do seldom worked for Billy Ray. Each child is unique. 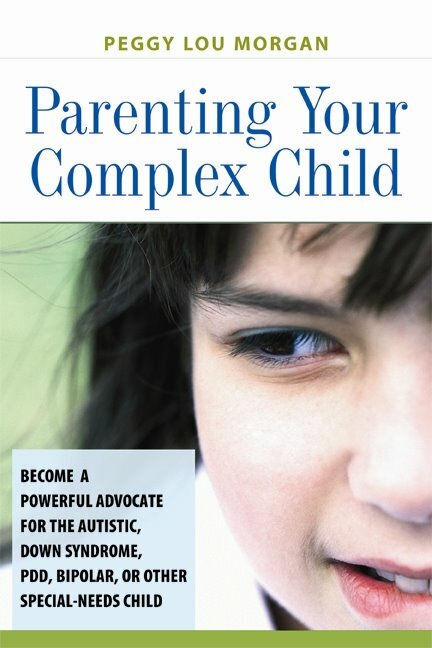 I wanted to share methods for adapting and customizing a life for your child. I am going to Barnes and Noble today to see if they have it. I can't wait to get my hands on it, I know this book is going to help K.C. and I a great deal. Congratulations to Peggy Lou and Billy Ray! We hope to be able to add this book to our library soon.